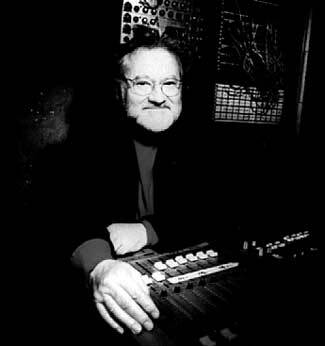 This year’s Grec Festival had a French theme to the programming, and among the works to be performed was a piece by French musique concrete composer Pierre Henry. Sadly Monsieur Henry was not on hand to perform the piece as well and this task was taken over by Señor Carlos Gómez. The performance took place in the lower level of the Tàpies Foundation building, a modern art gallery space dedicated to the celebrated Catalan painter Antoni Tàpies. The piece to be performed was “Variations pour une porte et un soupir” (Variations for a door and a sigh), originally composed in 1963 and comprising sound made from only three sources: creaking doors, the breath (inhaled and exhaled) and a flexatone, all further processed by tape manipulation. The entire piece is broken into 25 variations, some with just one of the sounds, other with all three. In this case, Gómez was using a laptop to reproduce the original taped sounds and a mixer to create complicated stereo effects. 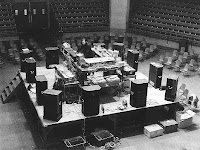 Gómez was seated in the middle of the room with the audience spread out in 360º around him with about a dozen speakers placed at regular intervals at the periphery of the circle facing inwards, similar to the picture. As simple and as academic as the piece sounds, it was quite impressive the amount of variation that could be achieved with such limited source material. Some pieces were calm and gentle, one resembling the ocean, while others were heavy and aggressive. In particular, the last variation “mort” (death) recalled a gun battle with machine guns and explosions. The creaking door noises were amazingly plasticine, resembling scorching guitars, geese or especially jazz brass honking that you could almost jam over the top of while there was a certain industrial music quality to some combinations of breath and machine. I had the pleasure of seeing Monsieur Henry perform in person in Paris in November 1997 at the Radio France building near the Eiffel Tower. 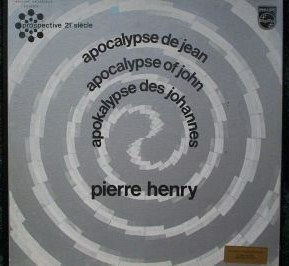 On this occasion he performed his seminal tape collage piece “Apocalypse de Jean”. Although conforming to a more classical audience-stage set up, it was nonetheless a curious arrangement with nobody on stage, only a hundred or more speakers of differing sizes with Monsieur Henry at the back of the room at the mixing desk. The vinyl box set version of this work released on the seminal Prospective 21e Siècle label remains one of my most desired fetish objects. Finally, while still on Pierre Henry, a book entitled “Pierre Henry’s House of Sounds” with an accompanying CDs of unreleased material was published earlier this year by Gilka. The book is not, however, a standard biographical work, but instead a collection of Geir Egil Bergjord’s photos of Monsieur Henry’s house in Paris on Rue de Toul where he has lived and worked since 1971 and is thus an intimate visual portrait of the man with many clues as to his methods and thinking. Always jealous of your live exploits, and this sounded wonderful. We went to the Tapies foundation every trip to Barcelona, it's a great space, particularly that upstairs library.